Appetizers are garnished with lettuce and tomato. Topped with shredded chicken or ground beef, beans, chili con queso, guacamole, sour cream and jalapenos. Topped with grilled chicken or beef fajitas, beans, chili con queso, guacamole, sour cream and jalapenos. With chili con queso and jalapenos. Topped with beans, chili con queso and jalapenos. Quesadillas, southwestern egg roll and jalapeno poppers. New! Avocado wedges lightly breaded and fried served with cilantro ranch. New! Sliced zucchini, breaded and fried served with Cilantro Ranch. New! Grilled fajita chicken breast served on a bed of romaine lettuce with roasted sweet corn, bacon, avocado, and egg. Lettuce topped with grilled chicken or beef fajitas, tomatoes, fresh onions and crispy tortilla strips. Chicken, lettuce, tortilla chips, charro beans, guacamole and pico de gallo. Delicious melted white cheese with your choice of beef fajita, chicken fajita or chorizo. Chile con queso, with beans, pico de gallo, guacamole, and your choice of fajita beef or chicken. Our large chili con queso with shrimp and crabmeat. Grilled flour tortilla filled with Monterey Jack cheese, mushrooms, bell pepper and onions. Double the size of our regular quesadillas. Choice of beef fajita or grilled chicken. Grilled flour tortillas filled with fresh spinach and Monterey Jack cheese, served with guacamole, sour cream and tomato. Two (2) flat crispy corn tortillas topped with shredded chicken or ground beef, beans, lettuce, tomatoes, guacamole, sour cream and grated cheese. Two large eggs served (over easy or scrambled) with rice, beans, ranchero sauce and flour tortillas. Scrambled eggs with fajita or chorizo. Served with beans, rice and tortillas. Stuffed with ground beef and topped with ranchero sauce and cheese. Served with refried beans, rice and tortillas. Big crispy flour tortilla filled with chicken or beef fajitas served with chili con queso, lettuce and tomatoes. (3) chicken enchiladas with rice, beans and our special sour cream sauce. Three (3) cheese, chicken, or beef enchiladas, rolled in corn tortillas, topped with chili con queso. Corn tortilla stuffed with chicken, the smothered in special tomatilla verdes sauce, served with rice and beans. Grilled chicken or beef fajitas rolled in corn tortillas topped with chili gravy and grated cheese and served with guacamole and pico de gallo. Corn enchiladas filled with shredded beef barbacoa, smothered with enchilada sauce and cheese, served with rice and beans. One (1) each of chicken, beef and cheese served with rice and beans. Three (3) cheese and shrimp rolled in corn tortillas, topped with special Julio's style sauce. Two cheese, chicken or beef enchiladas served with rice and beans. 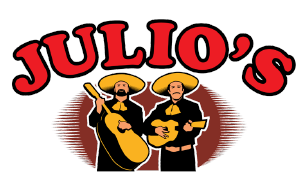 Julio's takes pride in serving its specialty of grilled chicken breast and beef fajitas. Fajita platters are served with grilled onions, guacamole, pico de gallo, rice and beans. Add Grated Cheese Or Sour Cream For - $0.99 Each! Beef, chicken and shrimp served with mixed vegetables. Zucchini, squash, mushrooms, tomatoes, and onions. Feeds 4: Beef, chicken, shrimp and sauteed poblano, tomatoes and onions. Served with Spanish rice and choice of refried or charro beans. Shredded chicken or ground beef. Three crispy tacos. Two cheese enchiladas topped with ranchero sauce, served with guacamole and chili con queso puff. Four tamales topped with chili gravy. Guacamole, chili con queso, taco, chalupa, enchilada, tamale and bell pepper stuffed with choice of chicken or beef. Beef taco, cheese enchilada and tamale. One Cheese enchilada, beef taco, rice and beans. Shredded chicken or ground beef taco, chalupa, tamale and enchilada served with guacamole, chili con queso puff and tomatoes. Two extra long crispy corn tortilla "flutes" filled with chicken or beef and topped with guacamole and sour cream. Choice of shredded chicken or ground beef. Two burritos topped with chili gravy and cheese. A crispy flour tortilla stuffed with chicken or beef and topped with guacamole and sour cream. Guacamole, chili con queso, beef taco, cheese enchilada and tamale. Large catfish filet served with french fries and garden salad. Grille to perfection our tender tilapia filet is served with rice, pico de gallo and savory grilled vegetables. This delicious filet is topped with crawfish tails. Tilapia blackened served with grilled onions, tomato, jalapeno, and squash. Served with rice. Six (6) shrimp or chicken wrapped in bacon and stuffed with Monterey Jack cheese and jalapenos. Served with guacamole, rice and beans. Uniquely seasoned shrimp served with our delicious ranchero sauce. Served with pico de gallo, guacamole, rice and beans and flour tortillas. Sauteed with just the right amount of garlic. Served with guacamole, pico de gallo, rice and beans. Eight (8) jumbo fresh shrimp served with our special Diabla sauce, pico de gallo, guacamole, rice and beans. Two crawfish burritos topped with ranchero sauce and Monterey Jack cheese. Served with pico de gallo, guacamole, rice and beans. Catfish filet and six (6) fried shrimp served with French fries. Served with pico de gallo, rice and beans. Large shrimp seasoned, grilled on skewers and served on a bed of rice with beans and salad. Eight (8) jumbo fresh shrimp served with guacamole, pico de gallo, rice and beans. Fajita steak topped with ranchero sauce served with pico de gallo, guacamole, beans and rice. Fajita steak seasoned and grilled with mushrooms, onions and bell peppers. Ribeye steak, grilled to perfection, served with salad and fries. Add Grilled Onions, Mushrooms And Tomato For - $1.00 More! Sirloin steak, grilled to perfection, served with salad and fries. T-bone steak, grilled to perfection, served with salad and fries. 12 oz. rib eye with four (4) grilled shrimp, rice and grilled squash and zucchini. Chicken breast fried to a golden brown, served with fries and salad. Grilled chicken breast smothered in a chipotle adobe sauce. Chicken breast stuffed with spinach, topped with a mushroom sauce served with rice and grilled vegetables. Chicken strips with French fries and tossed salad. Avocado stuffed with chicken fajita or beef fajita served with a crispy beef taco, cheese enchilada, rice and beans. One (1) cheese enchilada, 5 oz. grilled chicken breast and four (4) four grilled shrimp, served with fresh pico and your choice of tortilla. Beef fajita with diced bacon, grilled tomato, poblano peppers and onions served with rice, beans, and tortillas. All plates served with guacamole, pico de gallo, rice and beans. Two burritos stuffed with grilled chicken or beef fajitas, smothered with chili gravy and cheese. Grilled boneless breast of chicken, garnished with bell pepper, tomatoes and onions. Grilled boneless breast of chicken topped with our special ranchero sauce. Fajita steak seasoned and grilled with mushrooms, onions and bell pepper and topped with white cheese. Served on a sizzling platter. Poblano pepper stuffed with choice of chicken, beef or cheese, smothered with our authentic ranchero sauce and topped with chili con queso. Grilled boneless breast of chicken with mushrooms, onions and bell peppers, smothered with white cheese. Diced beef sauteed with jalapeno, tomato and onions simmered in a secret sauce, served with guacamole, rice, beans and your choice of tortilla. Two (2) flour tortillas filled with grilled chicken or beef fajitas. Beef or chicken fajita with tomatoes, bell peppers, mushrooms and onions. Add Rice Or Beans For - $0.99 Each! Cheese enchilada, tamale, rice and beans. Guacamole, beef taco and cheese enchilada. Guacamole, chili con queso puff and cheese enchilada. Guacamole, chili con queso puff and beef taco. Beef Taco, chili con queso puff and cheese enchilada. Beef taco, chili con queso puff and chalupa. Beef taco, burrito, rice and beans. Beef taco, burrito and chili con queso puff. Beef taco, taco al carbon and flauta. Chili con queso puff, taco al carbon and flauta. 16 oz. red or green sauce. Soft or crispy, ground beef or chicken. Shredded chicken,, ground beef or bean and cheese. One (1) chicken, beef or cheese. One (1) Chicken or beef, or cheese. Chicken or beef fajita or grilled chicken. We offer a variety of fountain drinks and lemonade. Please ask server for options. Ask your server for juices available. A non-alcoholic version of our classic frozen drink, available in mango, peach, pina colada and strawberry. Julio's original frozen or on the rocks. Our signature margarita. A smooth, cool blend of Don Julio tequila, Patron Citronage, Everclear, orange juice, lime juice and sweet and sour mix. Made with your choice of Premium Tequila, Grand Marnier and sweet and sour, orange juice and a splash of lime juice. Our tropical margarita made with Blue Curacao, Herradura, Cointreau, melon liqueur, orange juice and sweet and sour mix. Our frozen house margarita with a shot of Amaretto. A frozen margarita with a mixture of great sangria wine. The best of both worlds wine and a margarita. Layered margarita: red, white and green. Made with Jack Daniels, Triple Sec, sweetened lime juice, sour mix and orange juice. Banana, mango, peach, raspberry or strawberry. A large Julio's original margarita served with an ice cold Dos Equis Or Corona upside down in the glass. Now serving draft beer! Ask your server for details. Made with Ron Rico Rum. Your choice of mango, peach or strawberry made with Ron Rico rum. Other mixed drinks can be made upon request. Choice of ground beef or shredded chicken, fresh lettuce, tomatoes, guacamole, sour cream and cheese. A flour tortilla stuffed with grilled chicken or beef fajita, smothered with chili gravy and melted cheddar cheese. Served with pico de gallo, rice and beans. Cheese enchilada and tamale served with pico de gallo, rice and beans. Grilled breast of chicken topped with melted mozzarella and jack cheese, sauteed mushrooms, onions and bell peppers. Served with pico de gallo, rice and beans.